Funny Girl is a LOL-worthy collection of short stories by some of your favorite lady authors, arranged for your enjoyment by Betsy Bird. Think of it as a smorgasbord of scrumptious literary offerings by Raina Telgemeier, Shannon Hale, and other gals who are guaranteed to make you laugh. The great thing about this short story collection is that it has something for everyone. Looking for an essay on a germaphobic mother? Check out “One Hot Mess” by Carmen Agra Deedy. A goofy graphic short? Cece Bell has just the fix with “A Most Serious Recitation of the Poem ‘Trees.’” All of the pieces pack a punch to pique the reader’s interest while moving quickly so as not to lose it. 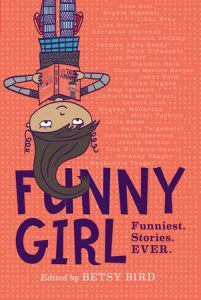 Funny Girl is perfect for reluctant readers (or readers with a short attention span) and those who are already fans of the featured authors in the collection. 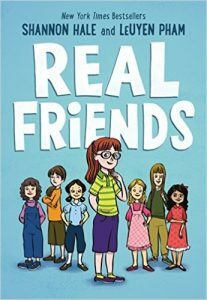 If you liked Funny Girl, then you’ll love Real Friends by Shannon Hale, Hamster Princess: Harriet the Invincible by Ursula Vernon, and Sisters by Raina Telgemeier.